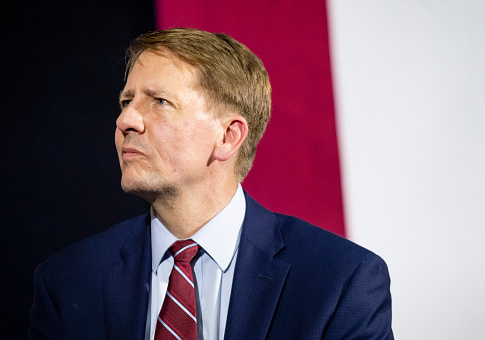 Richard Cordray, the former director of the Consumer Financial Protection Bureau who tried and failed to appoint his own successor, is out of a job again. The liberal Democrat lost his race to become Ohio's next governor to Republican Mike DeWine by a margin of 50 to 46 percent. Last year when Cordray resigned from the CFPB, he attempted to usurp President Donald Trump's authority to appoint a successor and installed his chief of staff Leandra English as "acting director" of the agency. Cordray's plot—inspired by several left-wing websites—ultimately failed when Trump appointed Mick Mulvaney to serve as the agency head. An Obama administration political appointee, English tried to keep the coup going, referring to herself as "acting director" in emails and meeting with Democratic lawmakers, including Sen. Warren, the architect of the CFPB. English finally left the CFPB in June and dropped her lawsuit against the government after months of pretending to be acting director, though no one was sure what she did all day. This entry was posted in Politics and tagged 2018 Election, Consumer Financial Protection Bureau, Ohio, Richard Cordray. Bookmark the permalink.